Valmont has released Valley Variable Rate Irrigation (VRI) for centre pivots, the first line of control-integrated variable rate irrigation controls in the industry. VRI Speed Control is utilized with either the Pro2 or Select2 control panel. It is based on an uploaded prescription and it automatically speeds up or slows down the centre pivot in as many as 180 different sectors around the field. The change in speed controls the depth of the irrigation application event. After May 1, 2011, VRI Speed Control will ship standard in new Pro2 and Select2 control panels; however, existing Pro2 and Select2 control panels may still be updated to include VRI Speed Control. 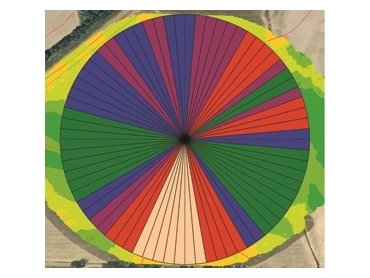 VRI Zone Control allows for maximum precision irrigation. With up to 30 different Pivot Zones along the centre pivot, sprinkler control valves located within each Pivot Zone pulse on and off to adjust irrigation application depth within one Management Zone (or “block” of a sector) in the field. The Pivot Zones can be independently changed as often as every two degrees, allowing for over five thousand different Management Zones around the field. Compatible with the Pro2 control panel, VRI Zone Control software is a separate package to be installed both into the panel and onto the centre pivot. Valley VRI a user-friendly computer program which allows operators to use existing field data, topography, soil, Veris maps, yield maps, or other specific field maps to develop prescriptions, or ‘irrigation plans’.